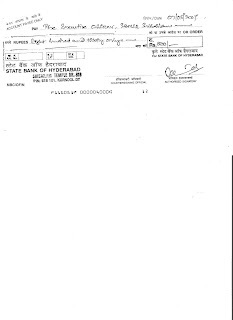 As your Revenue department is not accepting my room rent for the month of April 2007[Room No.10, C.V.C], I`m farwarding State Bank of Hyderabad A/c payee D.D. No. 146061 for Rs. 830 [Rupees Eight hundred and thirty only]. This is for your kind information. Copy to: Commissioner Endowments, Hyderabad.